We awoke around 8 with aspirations to do some incredible hikes during the day. After a quick breakfast, we found ourselves sitting at the trail head of the North and South Bubble trails. It was pouring outside. The rain broke for a little so we decided to give it a shot and hike to the trails. It is great to see how much shelter the trees provided us while hiking the trail; we hardly knew it was raining unless a strong wind jostled the trees and sent water down upon us. About half an hour into the trail, we broke out of the woods and continued to hike up the trail along the rock path. At this point it had stopped raining but the rocks were still slippery. We hiked up the South Bubble first and were treated to 360 degree views of the valley below. We then located the rock in which the trails are named after. 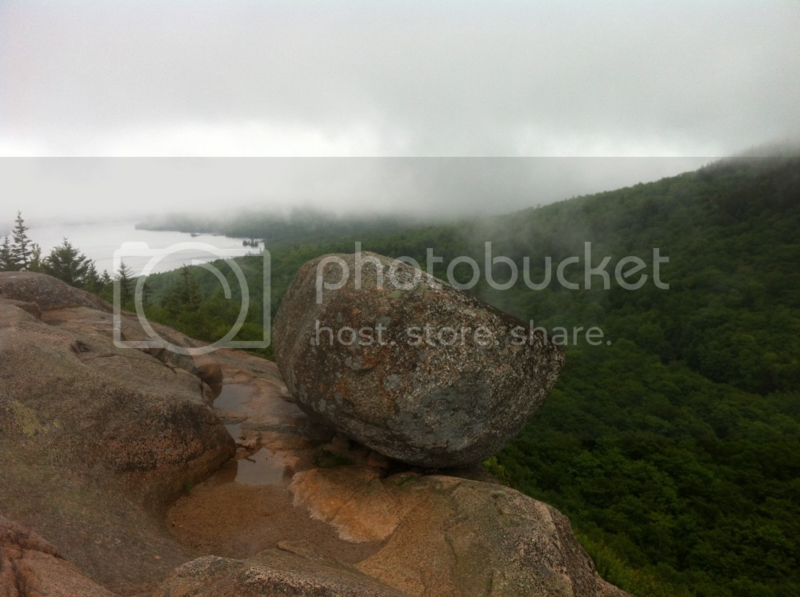 Bubble Rock: The boulder is about 10 feet high by 15 feet wide by 6 feet deep but it is perched on the ledge so precariously so that it seems as if one could push it over the ledge down into the depths below. Many have tried, but none have succeeded. Some pictures and a little exploring later, we decided to head down and go up the North Bubble, a short half mile trail. It was much of the same views and so we decided to head down to the car and try to catch mass in Bar Harbor. On the way we stopped at Cadillac Mountain, the highest on the island, and took in some of the foggy, views from the top. It was very windy on top so we stayed for only a moment before heading on our way.